In a sport famed for its characters, both in and out of the ring, one man’s sheer presence casts a dark, sprawling shadow over his peers. Muhammad Ali’s larger-than-life persona may have been the only thing sharper than his left jab, and his mouth … the only thing bigger than his right hook. An Olympic gold medalist and Heavyweight Champion of the World, Ali won 56 of his 61 professional bouts, many of which are still considered among the greatest fights in boxing history. 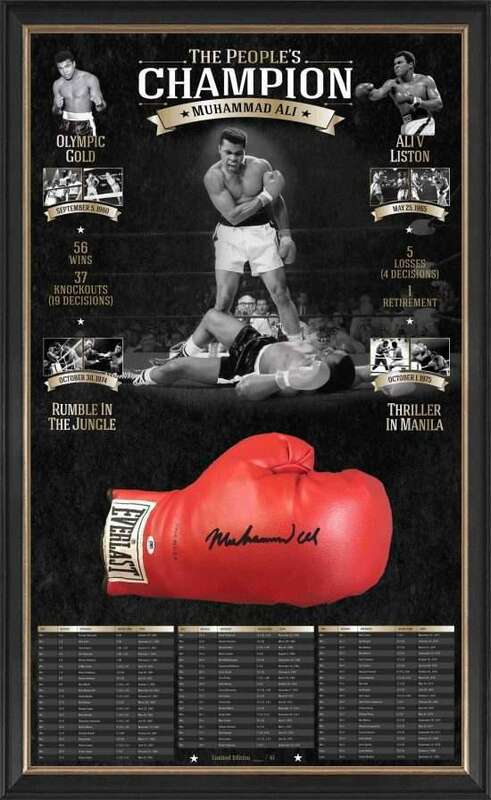 This fantastic Ali personally signed Everlast glove comes beautifully box framed with backdrop imagery.